Although we enjoy our work, there’s a lot of careful consideration that goes into demolition. AC Demolition puts great care into safely taking apart a building. We promise to deliver an unbeatable level of detail whilst carrying out our demolition services. All of our work is tackled with our simple philosophy of safety first. Although demolition is inherently risky, we are proud to have earnt, and maintain our excellent safety record within the industry. As a locally owned and operated family business, we pride ourselves on providing a friendly service to customers of all kinds. Whether you are a Private Home-owner or a Shop Front or Warehouse business. We can provide expertise, on-site inspections, advice, and are even available after hours if necessary. 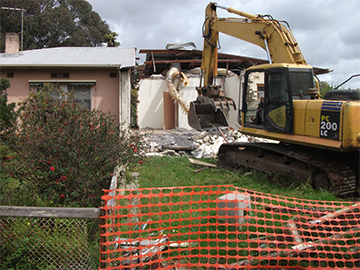 Partial Demolition – Internal and External, Gardens, Fences, Retaining Walls, Pools. Because we understand that most of our projects are clearing the way for a new construction, we also work with our clients to help them plan the next stage. We can even excavate and prepare the site to make sure it's ready for the next stage you have planned.